Q. 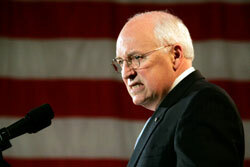 What is Vice President Cheney up to? I’m not being facetious. Last June’s Pulitzer-Prize winning Washington Post series on Cheney -- even though it only skimmed the surface and focused on actions in the fairly distant past -- nevertheless made it clear that the conspiracy theories about Cheney secretly pulling the levers of power were, if anything, understated. Since then, even more has come out about the central role he and his chief enforcer, David S. Addington, have played in Bush’s most excessive overreaches of executive power, including the adoption of torture techniques for the interrogation of detainees and the bulldozing of legal limits on government eavesdropping. If you’re looking for motive, nobody is more threatened by a potential rollback at the hands of a Democratic president than Cheney, who has invested every fiber of his being in assertion of executive power and the execution of a muscular foreign policy – both in the name of trying to keep America safe. According to Cheney’s neoconservative philosophy, the exercise of power itself projects strength and leads to impregnability. By contrast, too much diplomacy, restraint and most particularly withdrawal invite attack. Cheney has repeatedly said that a withdrawal from Iraq would not only be an “act of betrayal and dishonor” but would provide terrorists with “a staging area for further attacks, with America as the target.” If he truly believes his country will be attacked if we withdraw, then to what lengths will he go in order to prevent that from happening? Q. How are Cheney loyalists spending their time these days? Q. What is Cheney doing to prevent a future administration from undoing what he considers all his good work in Iraq and the war on terror in general? Q. What is Cheney doing to prevent a future president from restoring the pre-Bush separation of powers? Even presumptive Republican presidential nominee John McCain has promised to take a more restrained approach to the powers of the presidency. But are we really to believe that Cheney is sitting around idly, waiting for everything he has done to be undone? That’s just not the Cheney way. Cheney is notoriously secretive, but reporters should be doing everything possible to find out who he and his people are talking to, where they're going, and what they're saying in public. Just yesterday, in a speech to the U.S. Chamber of Commerce, Cheney indicated that he doesn't intend to let a future administration dismantle all his good work. Asked what he considered the most important achievement of the past seven years, he replied; "I would point to what we've done with respect to the global war on terror... [I]t is not an accident that it's been now nearly seven years since 9/11 and we haven't been hit again." And he spoke of how important is it that "we do whatever's necessary to defend the American people here at home. We can do it. We've proved it now for the last seven years and the next government, both the legislative and executive branches will be tested in terms of whether or not they're willing to continue on that vein or buy into the proposition that somehow we ought to dismantle it all and that we shouldn't be doing what we're doing. I think we did exactly the right thing and I plan to do everything I can to defend it." I have held another image in my mind for 5 years, ever since I knew the bush regime was lying about Saddam/Iraq: Cheney, Bush, Rove, Addington, Feith, Wolfie, Rambone, and let's not forget Perle and Rummy, and the rest of them doing a perp walk into jail. How can we as a citizenry ever forgive the House & Senate Democrats for walking away from their responsibility as 1 branch of government? How can we ever forgive them for putting their party strategy above America's legal, moral and ethical principles? If we allow the bar to lowered this far,(treason) how will we ever hold a White House responsible for anything? For the sake of America's future, we much impeach - we must hold them accountable.